One of the most common complaints from those who are actively involved in the community or who volunteer with one of our many nonprofits is the frequency with which important programs and events in the village conflict with one another. Last night was a case in point: The YS Schools and Antioch College had an important program on the future of education; Village Council had a rare Tuesday night meeting; and the Yellow Springs Community Foundation had a regularly scheduled board meeting. There were probably a couple other meetings that I am not aware of. 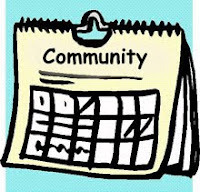 Whenever the topic comes up, someone usually laments the lack of a calendar of community events that can be posted to and consulted whenever an organization is planning an event. Someone else will usually reply that such a calendar is of no use, if people don't post their events to it. The fact is that there is such a calendar and it is, indeed, underutilized. It resides on the Chamber of Commerce Website at www.yellowspringsohio.org/calendar/. I am writing this to remind folks that it is there and to encourage them to use it. To make it easy to access, I have included a link to it in the sidebar. Just click on it and you will be taken there. You have no excuse if you schedule your event at a time when another event is already on the calendar. Thanks so much for letting folks know about the Chamber's calendar of events. Our events calendar is geared for events that are entertainment-oriented as opposed to government or organizational, for example, we wouldn't include Council meetings but we did include the Antioch event. We post events when we receive press releases and notification. Events can be submitted to us for posting via a link on the calendar page. There is also a link to the YS News calendar that is better for community and government meetings than the Chamber calendar. Government meetings will only change from their regular schedule in very special circumstances and one of those is a Monday holiday which is why the Council meeting was Tuesday night and they are seldom if ever cancelled for any reason. Last night was the first SRO Council meeting I can remember for a few years. It was great to see so many folks participate in the process. I am also extremely delighted that you mentioned this calendar -- it's a vital tool that needs more visibility, and I'll be mentioning it to everyone I meet! Technically-speaking, this calendar is more of an "event blog": like a blog, it contains articles ("events") that have titles & dates, and those events are shared via an RSS feed -- though, unlike a blog, those dates are in the future (with archives). A true "calendar", while conceptually quite similar, has a very important technical difference: The date information is in a specific format which is understood by myriad calendar-related tools. This subtle difference is entirely unimportant in the context of someone browsing the calendar -- but it is *vitally* important when it comes to *sharing* calendar data. Some examples: When I use my web browser or smartphone to click on the RSS feed link, my laptop or smartphone RSS reader allows me to subscribe, and the events appear alongside articles from AYellowSpringsBlog and so on. When I click on a true calendar feed, though, it's my Calandar app that prompts me to add a new source of *calendar* data (so I get an alarm 15 minutes before the start, see a list of today's events, etc.) -- it's a different tool for a different task. This has other ramifications as well -- it affects search visibility (Google, etc., treat calendars quite differently from blogs, which is likely why my own searches for such a calendar found the Emporium's calendar-formatted feed, but not this one). I hope this convinces you that there is an important change to be made; I would of course be more than happy to share my expertise on a pro-bono basis, including working with Servlet to fix this. Technically-speaking, this calendar is more of an "event blog": like a blog, it contains articles ("events") that have titles & dates, and those events are shared via an RSS feed -- though, unlike a typical blog, those dates are in the future (with archives). When I click on a true calendar feed, though, it's my Calendar app that prompts me to add a new source of *calendar* data (so I can get an alarm 15 minutes before the start, see a list of today's events, etc.) -- it's a different tool for a different task. This has other ramifications as well -- it affects search visibility (Google, etc., treat calendars quite differently from blogs, which is likely why my own searches for YS-related calendars found the Emporium's calendar-formatted feed, but not this one).